KHOTANG, Jan 8: Work to blacktop Mahure-Phoksingtar section of Gaighat-Diktel road is going on full swing begun. Blacktopping work had begun last year, 23 years after foundation stone for the road project was laid. The then Prime Minister Late Manmohan Adhikari had laid the foundation stone for the Gaighat-Diktel (101 kilometer) road project in 1994. 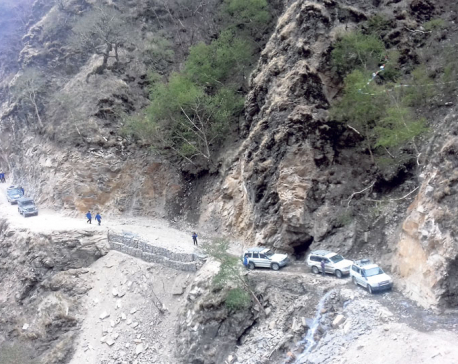 The road is a part of Sagarmatha Highway Project. According to the Department of Roads (DoR), the Mahure-Phoksingtar section (49 km), which lies in Khotang district, has been divided into two sub-sections for blacktopping. The work has been awarded to two contractors -- Bharat Construction/Siddhi Shahi Joint Venture (JV) and Devnarayan/Pawan/Mainachuli/Khampache JV. Both the contractors have signed agreements with the DoR to complete the work by July 2020. The 22-kilometer Mahure to Simpani Bhanjyang sub-section is being blacktopped by Bharat Construction/Siddhi Shahi JV, while the Simpani Bhanjyang to Phoksingtar sub-section (27 km) is being blacktopped by Devnarayan/Pawan/ Mainachuli/ Khampache JV. The contractors are currently expanding width of the road, and building retaining walls and drainage systems. The total project cost is Rs 910 million. Rajan Thapa of Bharat Construction/Siddhi Shahi JV said that they would continue the work during rainy season as well as construction of a bridge over Sapsu Khola is nearing completion. Devnarayan-Pawan/ Mainachuli/ Khampache JV has deployed about 350 workers, including 16 skilled workers, in the project site, whereas Bharat Construction/Siddhi Shahi JV has deployed about 250 workers for the project. Blacktopping was initiated after the Ministry of Alliance allocated Rs 2.6 billion for the Gaighat-Diktel road project in Fiscal Year 2016/17. The road meets the Mid-Hills Highway at Mohure via Phoksingtar -- the boundary of Udayapur and Khotang districts. 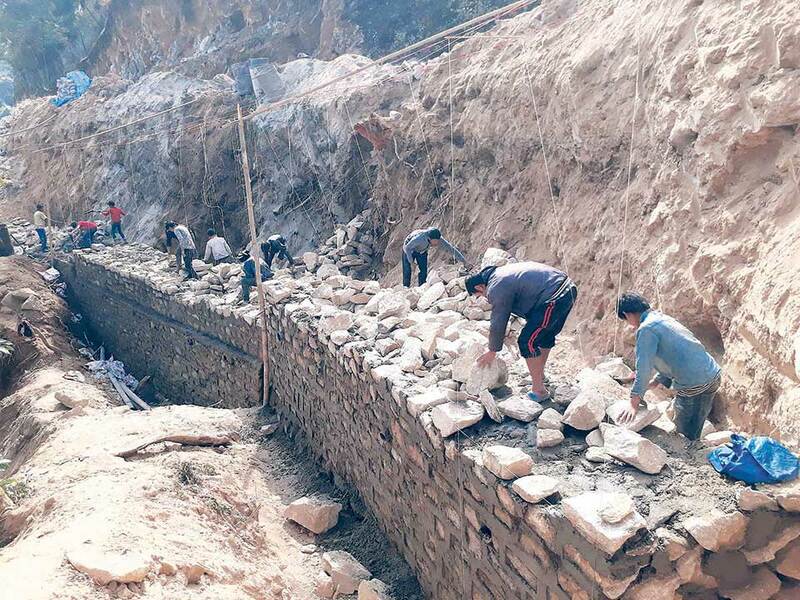 A team of experts mobilized by the District Coordination Committee, Khotang, had visited the project site on January 1 to put pressure on the contractors so that quality of the work is not compromised. Officials of Khotang DCC told Republica that works in both the sub-sections were going on at a satisfactory pace. “Road upgradation work is moving ahead at a satisfactory pace,” Udaya Bahadur Karki, a member of Khotang DCC and coordinator of Committee for Physical Planning and Infrastructure Development, told Republica. The team also visited the construction site of Sapsu Khola Bridge. The officials, however, said that they were not satisfied with the work progress at the bridge construction site.